I did it! 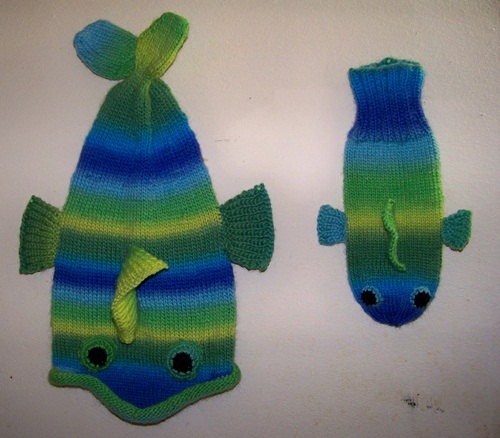 I finally came up with mittens to match my dead/alive fish hat! And it’s is so SIMPLE! First choose your favorite BASIC mitten pattern. 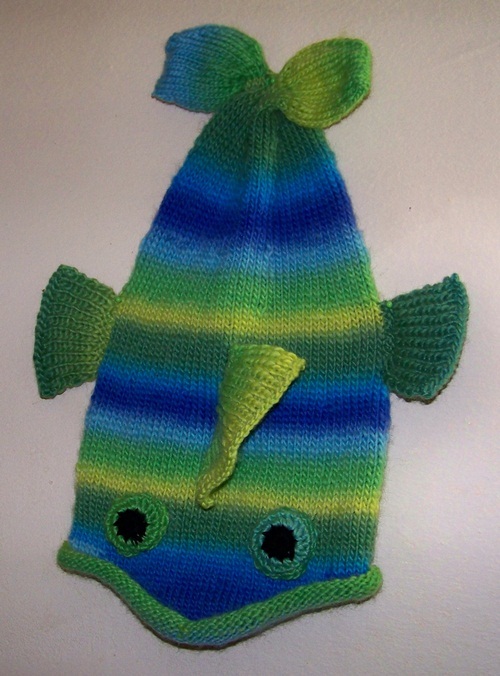 I chose an after-thought-thumb, round top mitten and knitted the basic mitten in colors to match the fish hat. Then I added eyes and fins. Eyes can be crocheted or buttons or felt, whatever you want. Sew on about 1 inch from tip of mitten. For the Dorsal fin, I cast on 10 stitches, knitted one row, then increased in each stitch for a total of 20 stitches. Then Knit 1 Purl l for 5 rows. Bind off. Sew to center of mitten about 1 inch away from eyes. The Pectoral fins are a cast on of 5 stitches. Knit 1 row. Then increase in each stitch for a total of 10 stitches. Knit 1 Purl 1 for 5 rows. Bind off. Make 2. Sew to sides about 1 inch back from beginning of Dorsal fin. Don’t have enough of this particular yarn to finish the second mitten. Will try to find some, but may not be able to as it is discontinued. Anyway working on another hat and I will have enough yarn to make matching mittens and maybe even a scarf. Fish Hat…This One is ALIVE! These hats are addicting. Had to make another one. Only this time I made it “alive”. I added crocheted eyes and a little stuffing to make the eyes pop. I used Knit Picks Chroma Worsted yarn for this fish and size 7 circular needles 16 inches long. I found it is much easier to do the short rows on circular needles than on double points. Of course as I went along and the width of the fish got smaller, I had to change to double points. I also knitted the tail fins in the round and Kitchener stitched the opening closed. 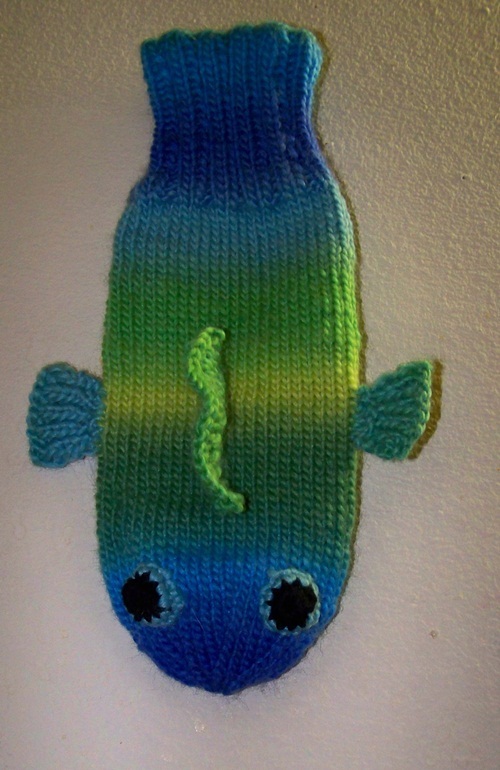 Then I knitted the dorsal and pectoral fins separately and sewed them on.